Greens are all part of the same family, but collards, mustards and turnips each have different flavors. Radishes are the vegetable equivalent of "instant gratification." They're one of only a handful of veggies a gardener can sow from seed at the beginning of a month and harvest by month's end. The only way to get a bunch of radishes faster is to bring one home from the supermarket. 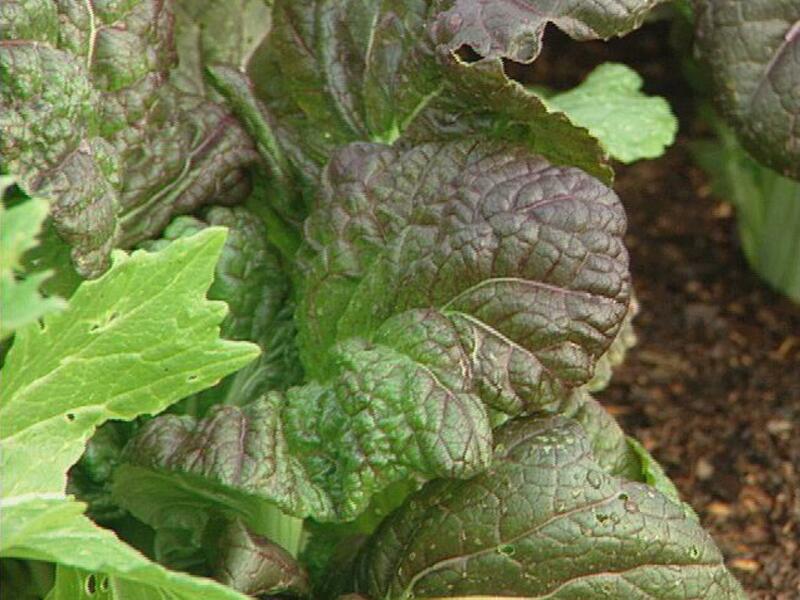 Other quick-crops include baby salad greens, turnips and scallions. And, if the weather cooperates, it's sometimes possible to pluck a few baby beets in the time it takes radishes to mature. Quick-crops are good veggies for children to grow, because they're ready to pick so soon after sowing. But they're an effective tonic for the rest of us as well. Not only do they jump-start the season in the kitchen garden, quick-crops are often the first homegrown vegetables to make it to table after a winter of grocery store produce. And first always tastes best. Because all these sprinters are cool season crops, the ideal window of opportunity for sowing them is relatively brief. Here in western Pennsylvania (USDA Zone 5b), we get about two months of good radish weather in spring and another month and a half in fall. It's certainly possible to plant radishes after that time, but gardeners who experiment quickly discover that hotness is directly related to soil temperature. 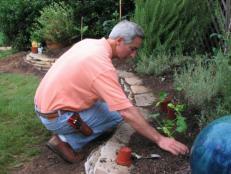 Roots that are pleasantly tangy in spring become fiery hot when pulled from the soil in July. Spring-grown radishes are also less prone to splitting and pithiness — two problems related to watering. The roots expand so quickly that if the soil dries out, as it often does in summer, they literally "burst at the seams" after a good soaking. Pithiness is the spongy texture radishes acquire when they get too mature. Don't turn your back — it takes only a day or two. When sowing radish seeds, plant some about a half-inch deep and the rest a little deeper. Those close to the surface will germinate more quickly, extending the harvest by a few days. The deeper roots will be later, but larger, than the shallow ones. One of the "perks" of spring sowing is that insects usually aren't stirring so early. Flea beetles and roots maggots are just waking up when the first batch of radishes is being sliced into a salad. Bugs will be a problem later in the summer, but for now the roots are so smooth and firm, nearly perfect without having to worry about pests. 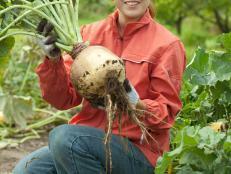 With interest swelling as fast as turnips grow, gardeners may begin sowing this old-fashioned root crop again. 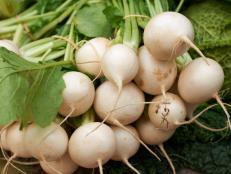 Most vegetable seed companies offer just one or two turnip varieties, so shop around. 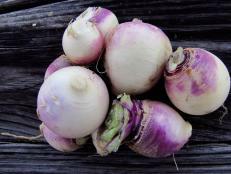 Best known is 'Purple Top White Globe', the standard by which turnips are judged. One heirloom variety, called 'Pinfeather', sports green shoulders on large white roots. 'Snowball' is pure white. 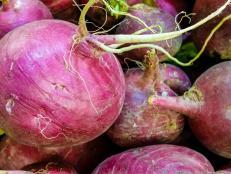 Like radishes, turnips are sown in spring or fall, though many gardeners prefer the flavor of fall-sown roots because they're less bitter. "Red Milan" is recommended especially for spring planting. 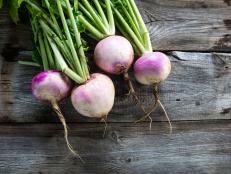 Sow turnip seeds early. Thin the crop often to give roots ample room to swell. In a couple of weeks from sowing, the first baby globes will be ready to pull. Check the row regularly after that — turnips mature with amazing speed. Scallions are the quickest quick-crop of all, ready within days of planting if you start with a fistful of "bunching onions." Scallions are a little tricky from seed, for the seeds are powder-fine, and transplants must be started early indoors. But many seed companies offer bundles of pre-started scallions, which they'll ship on the date you request, to shave days off the harvest time. Salad greens are so abundant it's impossible to describe all of the varieties available. Salads will never get boring if you mix and match spring lettuces with tangy arugula and baby spinach leaves. And no quick-crop is more versatile than greens. As soon as they arrive, quick-crops are gone. With shade cloth and misting, it's possible to squeak out another week or two, but it's much simpler to tack those extra days onto the beginning of the season with raised beds. For peak flavor and freshness, practice successive sowing. Don't hesitate. Just pull out plants that have passed their prime, even if it means composting them. Sow fresh seed in their place, and in the blink of an eye, another row will be ready for harvesting. 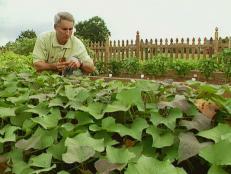 Lindsay Bond Totten, a horticulturist, writes about gardening for Scripps Howard News Service. 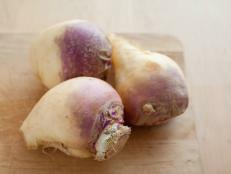 Take the time to prepare rutabaga – both greens and roots – for freezing. Learn how to blanch the greens and mash the roots. 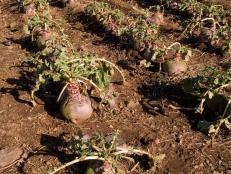 In addition to producing delicious edible root bulbs, rutabaga provides easy-to-grow leafy tops packed with nutrition and fiber. Economical and reliable for several years, rutabaga seed makes it easy to plant a nutritious, delicious garden crop for fall.